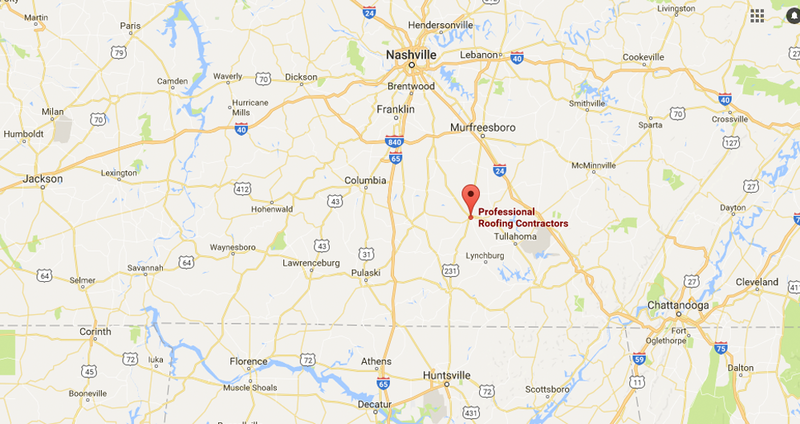 Many of the commercial buildings in Middle Tennessee and Northern Alabama have low slope or flat roofs, which are well-suited for membrane roofing systems. 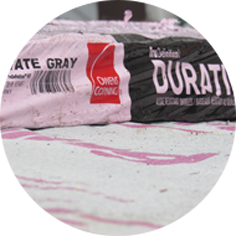 These membranes are great materials to use because they are impervious to water. All of these membranes come with manufacturer's warranties ranging from 10 to 30 years, depending on the application and thickness of the material. EPDM Roofing System: This is what you know of as the rubber roof. It's normally black but is now available in white as well. These membranes are installed with seam tape that holds and seals the panels together. 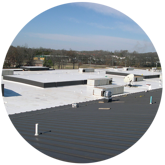 TPO Roofing System: TPO is a thermoplastic polyolefin membrane that can come in colors like white, gray, or tan. 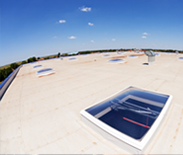 In contrast to EPDM, TPO uses heat-welded seams, and has highly reflective surfaces, making it a very energy-efficient roofing system. PVC Roofing System: PVC is a thermoplastic polyvinyl chloride membrane that can be found in white, tan, gray, or even other custom colors. These membranes can be custom-sized to fit your roof or they can be purchased in rolls and hot air welded together. 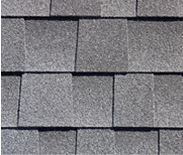 Both TPO and PVC membranes will protect the roof against standing or ponding water. 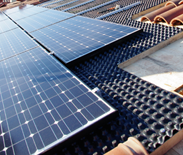 Also, PVC membranes are the most reflective in the industry, making it one of the most energy-efficient choices. 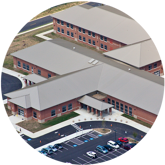 Single Ply Membrane Roofing has been the primary product of choice for commercial and institutional work involving flat to low slope roofing on new and existing buildings. 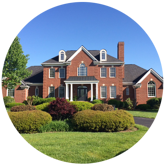 Our crews are certified to install EPDM, TPO and PVC Membranes with most of the major manufacturers, including: Firestone, Carlisle, GAF, Sarnafil and Duro-Last. 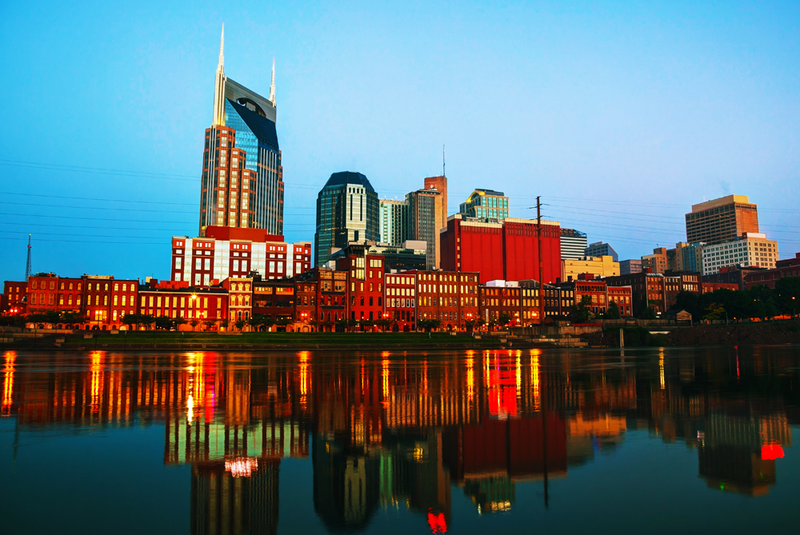 These manufacturers issue 15 to 30 year labor and materials warranties for jobs we install and consider our installations some of their best. These membranes have proved to last beyond the manufacturer's’ warranty periods and we recommend them with great confidence for their performance to keep our customers dry. We built our slogan "Keeping you Dry is our Business!" upon the success of these membranes. 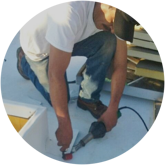 Membrane roofing is light enough to be used for re-covers over existing roofs, which often eliminates the need for expensive tear-off of the existing roof. 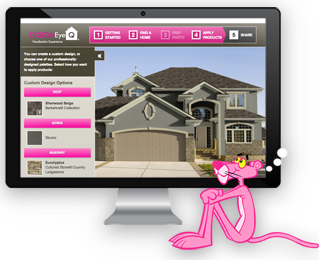 They are easy to inspect at the end of the job for compliance to manufacturers’ standards for warranty approval and do not demand constant monitoring during installation by consultants, such as built-up roofs, nor do they require any hot work with the liability of fires and the odor of an asphalt kettle. 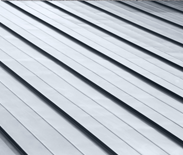 We have found that single ply roofs have made flat to low slope roofing easy and friendly to install and to maintain as leak free roofs for our customers and are environmentally friendly materials that can be recycled.